Dean is a British actor and singer, best known for his appearance on Life On Mars. Dean is best known as DS Ray Carling from BBC's best drama in years 'Life On Mars' and is soon to be seen in the spin off series 'Ashes to Ashes' in the spring of 2008. Life On Mars won countless awards and regularly had a viewing audience of over 7 million each week. 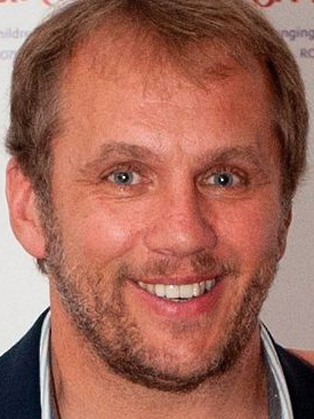 Dean Andrews is an accomplished Actor and After Dinner Speaker and continues to be a huge favourite with the public. Dean Andrews was born in Rotherham on August 6th 1963 and recently celebrated his 50th birthday! His parents were publicans and he lived at the Masons Arms pub in Wellgate and the Green Dragon in Kimberworth. Deans parents were both musical and professional singers and Dean followed in their footsteps. Dean has a great love of musical theatre.He belonged to the local Phoenix Amateur Operatic Society and appeared in several productions with Phoenix Players in Yorkshire as a youth. He went to Sitwell Junior school on Grange Road and Oakwood Comprehensive School (now called Oakwood Technology College) on Moorgate Road Rotherham. He began work at Kirkby Central, a Vauxhall car dealership, in Wellgate, then began singing at holiday resorts like Butlins and then on cruise ships for over twenty years. Deans big acting break was when film director Ken Loach was looking for local people to appear in his film "The Navigators". In this hard hitting film Dean played a rail worker in a gang with others working on the railways in 1995 under Thatcher's privatisation. The film had a strong sense of authenticity using Yorkshire people, gripped in a changing era. Dean then went on to appear in the TV series Buried, which won the BAFTA Award for Best Drama Series in 2004. He also appeared in Clocking Off. In 2005, he played the character of Steven Maynard in the ITV drama Wire in the Blood. In 2006, Dean landed the iconic role of DS Ray Carling in the BBC Drama Life On Mars. In 2008 he continued this role in Ashes to Ashes. Due to the success of LOM and Ashes Dean has gone on to star as the lead in The Case - a quite brilliant piece of acting from Dean, as well as parts in No Angels, Waterloo Road, True Dare Kiss and The Street. Dean played a leading role in the film "Kandahar Break" in 2009 about British Mine Clearance Engineers in Afghanistan. Dean went onto play Eddie Maynard in Marchlands which was hugely successful and the 2011 film United about the Busby Babes. He played Peter Evans in The Body Farm in 2011 and also a part in Being Eileen as the son of Eileen Lewis played by Sue Johnston. Dean then appeared in The Security Men alongside Bobby Ball and Brendan O'Carroll in April 2013. Dean then landed the role as Robbie in the BAFTA award winning drama Last Tango in Halifax which first aired in late 2013 and then the 2nd series screened recently. In between his acting work he has done a range of voice overs including Knorr Gravy stock cubes, Sky TV, Plusnet and Cadbury's. He recently appeared at Rotherham Theatre in September 2013 at a special one off night "An Evening with Deano and Steve" where he sang the classics with Steve Womack singer/comedian in his local hometown. He finished off the night singing 'Life on Mars" of all songs! Dean is currently on TV as Robbie in the second series of Last Tango in Halifax and is Tubby Baker in a new play 'That Day We Sang" at the Royal Exchange theatre in Manchester from Dec 5 2013 - Jan 18th 2014.